If you’ve ever had a septic leak, you know what a mess it can create. Not only does it smell terrible, but it can also cause hundreds or thousands of dollars of damage to your septic system, home structure, and landscaping. Don’t want to deal with this type of issue? Then call on our professionals for regular cleaning and maintenance of your tank. For years, our professionals have been ensuring the lasting durability and efficiency of our customers’ septic tanks, and we want to do the same for you. If it’s already too late for our septic tank cleaning services and you already have a more pressing issue, we are happy to provide 24/7 emergency solutions. But with proper maintenance, cleaning, and regular inspections, we can prevent a catastrophe in your home. Understanding how your septic tank works is vital to making sure it works properly. There are many issues that can arise without proper septic tank cleaning and maintenance, but with our expertise, you can be confident in the condition of yours. While there’s no rule to how often you may need to clean out your tank, we are happy to give you a rough estimate so you can always ensure your tank functions the way it is supposed to. In our time in service, we have seen many septic tanks that vary in size, age, and condition. Our experience has only led to more in-depth knowledge and fine-tuned skills. If you want to make sure your tank is working even when we’re not around, take advantage of our maintenance services. Caring for a tank is part of your daily life, whether you know it or not. Simple things like not pouring grease down the drain, not using excessive cleaning chemicals, and not using too much water, are critical to maintaining the right balance of good bacteria in your system. Without this balance, the bacteria can’t break down the waste inside the tank, which will eventually cause it to overflow or rupture. However, with our septic tank maintenance solutions, you get the information you need to take the best possible care of your tank. We’ll also perform a septic tank inspection and any cleaning or pumping services that need to be done to get your system into proper working order. While some of these signs could indicate a different problem, such as a ruptured pipe or simple clog, our specialists are happy to analyze the situation and give you a more definite answer. Sometimes, you’ll know something’s wrong with your septic tank without knowing exactly what. You may have just had what you thought was a good septic tank cleaning from a different company, but found out they weren’t as thorough as you had hoped. There may be other issues, such as ground shifts or trees roots crowding your system and causing it to malfunction. With our septic tank inspection professionals by your side, you can get to the main problem quickly. We’ll work diligently to repair any issue quickly so you can get back to not worry about your tank. 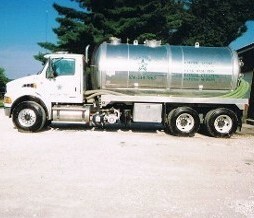 If you need help with your septic tank, contact us today. We service septic tanks in St. Charles, Wentzville, St. Peters, O'Fallon, and Metro East, Missouri.